Most people will see a body of water without giving any thought as to how it was created or how it has been used by the local population. This is especially true when visitors learn that one as large as Shasta Lake is held by 365 miles of shoreline. The fact is, humans have done some amazing things and the history of the Shasta Lake region is no different. 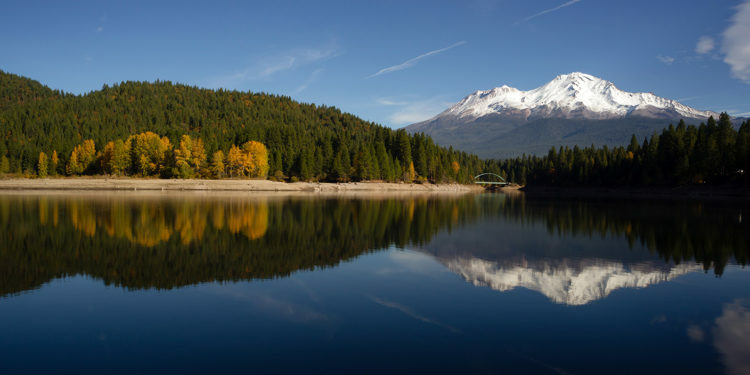 At more than 2 million acres, the Shasta-Trinity National Forest once encompassed hundreds of streams, rivers and mountain lakes. pine, oak, and Douglas-fir dominated the Shasta County landscape and the area proved itself worthy of supporting large pioneer ranching operations. Before that, the Pit River and Wintu tribes made their homes along the banks of the area’s waterways. The largest of these rivers, the Sacramento, travels 400 miles and carries more than 22.4 million acre feet of water from the Klamath Mountains to the Sacramento-San Joaquin River Delta and San Francisco Bay each year. This runoff has long-been captured and used to support the state’s vast agricultural system. The capture of the Sacramento River began in 1937 and when it was finished in 1945, Shasta Dam provided much-needed hydroelectricity and flood control. It was considered a great engineering feat and second in size only to Hoover Dam. In addition, the long-term water-storage capabilities of the dam made water conservation, control, and distribution to southern agricultural lands a reality. In the process, several towns including the mining town of Kennett, were submerged in an average of 400 feet of water by 1944. From then on, Squaw Creek, and the Sacramento River, McCloud River, and the Pit River would feed the 30,000-acre lake created by dam’s construction. As California’s largest reservoir, the local tribes and subsequent pioneer settlers probably never imagined that Shasta Lake would ever exist. Nor did they foresee the recreational opportunities that would come with the construction of Shasta Dam. Yes, the creation of Shasta Lake gives the state’s people the chance to harness the power of several rivers and control its flow for specific uses. 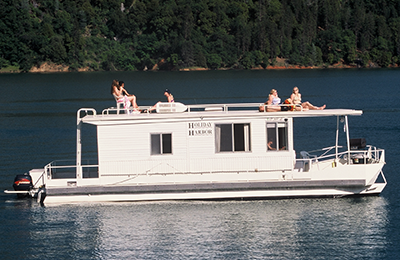 However, residents from Southern Oregon to Sacramento have embraced the area for its camping, fishing, and vast array of marinas offering rental opportunities ranging from personal watercraft to luxury houseboats. From native tribes to pioneer ranchers and industrial craftsman, Lake Shasta is full of rich history which has led to its current status as a powerhouse of water control and recreation.